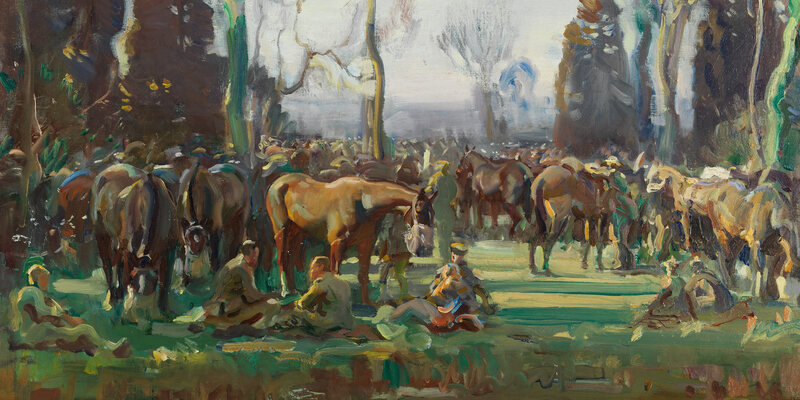 Join a curator on an hour-long tour of our exhibition, 'Alfred Munnings: War Artist, 1918'. Displayed together for the first time in a century, these impressionist paintings cover equine subjects, portraiture and pastoral landscapes. They highlight the role of horses in military operations, capturing their beauty in the war-affected landscapes of France in 1918. As an official war artist commissioned by the Canadian War Memorials Fund, Munnings provides an insight into the men of the Canadian Cavalry Brigade and the Canadian Forestry Corps. His paintings demonstrate both the important role of the cavalry on the Western Front and the vital work behind the lines that sustained the war effort. The exhibition includes paintings on loan from the Canadian War Museum, as well as selected works from the National Army Museum's own collection. The exhibition has been developed by the Canadian War Museum (Ottawa, Canada), in partnership with The Munnings Art Museum (Dedham, UK) and generously sponsored by The Beaverbrook Canadian Foundation. Local support has been kindly provided by Juddmonte.